View a video with Emily Falk, director of University of Michigan’s Communication Neuroscience Laboratory. New research from University of Michigan says brain scans showing neural reactions can predict behavior change even better than the person whose brain is being scanned. 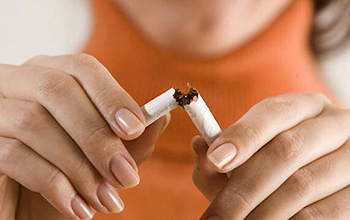 Study: Neural reactions to pro-health messages can predict if smokers will keep resolutions to quit. Emily Falk, director of University of Michigan’s Communication Neuroscience Laboratory, recently led a study that scanned the brain activity of 28 heavy smokers to investigate whether pro-health messages would have an impact on their ability to quit smoking. The smokers were recruited from an anti-smoking program. A forthcoming issue of Health Psychology, a peer-reviewed journal, will report the findings. For the study, functional magnetic resonance imaging (fMRI), a type of specialized scanning technology, was used to monitor how participants responded to a series of television ads designed to help people quit smoking. After seeing each ad, the test subjects rated how it affected their intention to quit, whether it increased their confidence about quitting, and how much they related to the message. A month after the scan, researchers contacted participants to see how they were doing and to obtain biological verification of how much they were smoking, by assessing their CO levels. Participants reported smoking an average of 5 cigarettes a day, compared with an average of 21 a day at the start of the study, and CO levels were consistent with these self-reports. The study was partially funded by Falk’s National Science Foundation’s research fellowship. The National Institutes of Health also contributed to the study. Falk’s colleagues Matthew Lieberman, Elliot Berkman and Danielle Whalen also took part in the study and evaluation of participants. To learn more about the study, see University of Michigan’s news article.